Berkeley's Bazian on Paris Attacks: It's the Islamophobia, Stupid! Originally published under the title, "Profs Distort, Dissemble about Paris Attacks." The panel discussion at Berkeley last month was billed as a move "to start a dialogue on the shooting rampage in Paris." Only in academe can a panel discussion on Islamic terrorism turn into an exercise in obfuscation and denial. 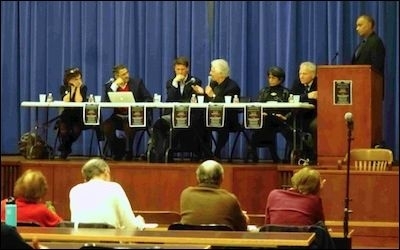 Titled "Shooting Rampage in Paris: Free Speech, Anti-Semitism, Freedom of Religion, Islamophobia," the recent University of California, Berkeley panel—which promised to "start a dialog" on the Charlie Hebdo and kosher supermarket attacks in Paris—featured six professors from a variety of UC Berkeley departments. This mixture produced an array of contrasting views, yet neither of the two Middle East studies specialists involved—anthropology professor Saba Mahmood and Hatem Bazian, a Near Eastern studies lecturer and founder of the Islamophobia Research & Documentation Project—addressed the topic in a forthright manner, but deflected controversial issues and issued apologias for terrorism. Despite the inclusion of intellectually honest panelists, the apologetics of Mahmoud and Bazian were all too typical. The large audience of students, faculty and community members filled Booth Auditorium in UC Berkeley's law school, Boalt Hall, where Saba Mahmood began the discussion. 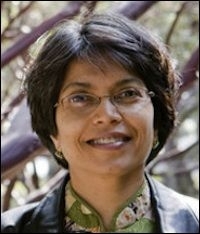 She claimed to be a "longstanding defender of the right to free speech," yet condemned "the wide call in European and American media to recirculate and celebrate the [Charlie Hebdo] cartoons" and Slate editor-in-chief Jacob Weisberg's promise "to escalate blasphemous satire," which she likened to an "escalation on the attack against France's most beleaguered minority." Focusing on the "question of why so many Muslims who do not condone the Paris murders are deeply offended by the cartoons," Mahmood labored to explain that, "They felt what I would call a moral injury on the desecration of the prophet [Mohammad]." She insisted that "the caricaturists . . . find some better way, instead of making Mohammad the icon of terrorism itself," ignoring that satirists depict Mohammad precisely because they are told not to, both by Islamic prohibitions and Western self-censorship. Precisely because France has a history of fighting anti-Semitism, one would imagine it could provide the resources, seeing some similarities with the way Muslims are being treated in Europe today. Mahmood exploited the history of Jews in France a number of times to buttress her arguments, without acknowledging that Jews today are fleeing the country for fear of being murdered by her favored victims. "There's a long history of racism in France that was once directed at French Jews and is now aimed at European Muslims," she asserted, as if French anti-Semitism was a free-floating virus that infected a different demographic. In an underhanded display of hyperbole and moral relativism, she asked, "Do we have to get to another holocaust before we realize what demonization means?" 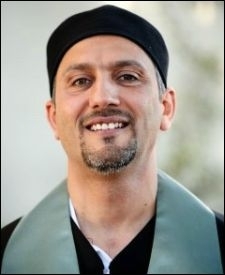 As befitting his role as director of UC Berkeley's Islamophobia Research & Documentation Project (IRDP), Hatem Bazian devoted the bulk of his talk not to Islamic terrorism, but to the mythical scourge of "Islamophobia." He opened by stating that he was "in France just before this event took place" for "a series of conferences on Islamophobia" throughout Europe, confirming that plans stated at the 2014 annual IRDP conference to create a field of "Islamophobia studies" are underway. Claiming that the "Broader Muslim community in Europe feels like it's under siege," Bazian lamented that, "Their inclusion and integration is predicated on their accepting to be insulted to be part of civil society," as if being held to the same standards as others constitutes inequity. He claimed to have documented a wave of "violence across the continent directed at Muslims," yet, artfully dodging the need for evidence, complained that because "they don't get reported . . . these cases do not get the attention required." Pivoting to America, Bazian drew ahistorical analogies between Muslims throughout the West and minorities in the U.S. After alleging job and police discrimination against European Muslims, he likened this "unequal treatment . . . to what African-Americans in this country face." Later, he referenced the "Black Lives Matter" movement and asserted, against all evidence, that "race is a subject we dance around but never really tackle." He also claimed that, "Muslims have been used as the patsies to deport two and a half million Latinos under Bush and Obama," while, regarding "massive migrations and disruptions," he declared, "basically we want to protect an imagined America that no longer exists." Why is it we have such radicalization in Europe? Is it because Muslims woke up and a DNA was activated within them, a radicalization DNA? Or is it a long history of instrumentalizing Muslims for a particular distorted global warfare. We are not talking [about people] who wrote a letter to the editor. We are not talking about people who sponsored a boycott, we are talking about murder. I was a student in Paris grateful for Charlie Hebdo, their lunatic insanity. You don't murder those you disagree with. There are ten million ways to poke fun at the terrorists. When you poke fun at the prophet, you poke fun at all the Muslims, implying that they are in line with or somehow connected to the terrorist act. At this point, sounds of disagreement and shouts of "No! No!" erupted from the audience; the moderator, history professor Tyler Stovall, interrupted Bazian, saying, "Excuse me, Hatem, I want to move on because there are more questions." One attendee reminded the panel that, "This question of anti-Semitism has gotten lost." Robert Alter, founding director of the Center for Jewish Studies, pointed out that "thirty-seven percent of French Jews are contemplating immigration" and maintained that the cause is "not limited to Muslims," but to the "French Right" and—in a rare admission in academia—to the "French Left," where there is a "a blurring between opposition to the Israeli treatment of Palestinians and old-fashioned hostility to Jews in their midst." These refreshing breaks with politically correct orthodoxy proved rare. Despite the inclusion of intellectually honest panelists and an audience that challenged prevailing views, the apologetics of Mahmoud and Bazian were all too typical. It is telling that Middle East studies, the one field where the public might hope to encounter rigorous, informed analysis regarding the perils of Islamic radicalism, instead provides obfuscation, moral relativism, and anti-Western bigotry. Until that changes, the discipline's biases make its pronouncements not simply unhelpful, but misleading and dangerous. Berkeley resident Rima Greene co-wrote this article with Cinnamon Stillwell, the West Coast Representative for Campus Watch, a project of the Middle East Forum. She can be reached at stillwell@meforum.org.